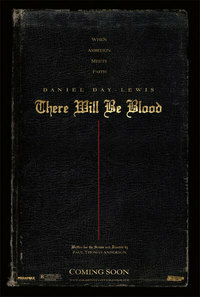 There Will be Blood is set in the late 19th and early 20th century, and tells the story of Daniel Plainview (Daniel Day Lewis), an oil prospector who comes to Little Boston, a small Californian town sitting on top of a huge ocean of untapped oil. With his last three films (Boogie Nights , Magnolia , and Punch-Drunk Love ), Paul Thomas Anderson has established himself as one of the most exciting - and almost certainly the most ambitious - of the American directors who emerged during the ‘indie Hollywood’ boom of the 1990s. Though certain themes and stylistic preoccupations can certainly be seen to reappear across his body of work, each new film he has made has constituted a significant departure from its predecessors; There Will Be Blood is no exception. Little in Anderson’s previous work could have prepared us for either the subject matter of this story, or the manner in which he has chosen to tell it. More to the point, apart from the break it represents with Anderson’s previous work, this film is also quite unlike anything else to have come out of Hollywood in at least the last twenty five years. Its closest possible points of comparison are probably the more epic end of the ‘Hollywood Renaissance’ in the 1970s, but even the reference points we could find from this period could not quite be said to form precedents for this film. Whatever else it is, this is a huge, complex, intense, strange - possibly even entirely unique - piece of work that thrills and perplexes in almost equal measure. If it sounds as if I am being unusually cagey, it is because There Will be Blood is an extremely challenging film, and one that - after two viewings - I feel I am only beginning to come to grips with. It is so manifestly impressive in so many ways, and yet is also occasionally frustrating - partly because it is so difficult to pin down. On its surface, its story would seem to be more grounded and straightforward than, say, those provided by the constantly shifting and slightly surreal worlds of Magnolia or Punch-Drunk Love. However, the specific ways in which Anderson tells his story mean that the film comes sometimes to feel even stranger than these more obviously fantastical creations - but always subtly, insidiously, so. One of the great joys of Anderson’s cinema is its multifaceted and eclectic nature - the fact that it can constantly surprise us and take us in directions we couldn’t anticipate. Perhaps it is partly because of the more ‘serious’ and ‘realistic’ nature of the story he is telling here that makes the often quietly unusual brushstrokes he uses to depict it so striking. Whatever the reason, the result is the same: a bold, curious, often difficult, challenge of a movie. In short, this is a film that (like other recent bold American movies such as The New World  and INLAND EMPIRE ) demands we meet it on its own terms, and requires a deeper engagement than a mere two viewings can provide us with. This fact alone should tell you that this is a fascinating and major work. If I am not yet liberally throwing around words like ‘masterpiece’, then it is because its great complexity also means that any critical evaluation of it - maybe short of a book-length study - must necessarily be considered a work in progress. It should probably go without saying, after all this evasive hyperbole, that this is nevertheless certainly a film experience that, at the very least, anyone who cares at all about modern American cinema should make sure that they have. Click here for an extended Alternate Take. This review was published on February 12, 2008.